38 June/July 2018 unmanned systems inside AIR EMERGENCY RESPONSE W hen hurricane Harvey hit Texas last August, drone operators became an integral part of the recovery response, f lying missions to inspect critical infrastructure, as- sess damage and map f looded areas. This marked the first time unmanned aircraft systems (UAS) were deployed on such a large scale after a hurri- cane and was a huge step forward in illustrating the type of good drones can do. UAS also played a vital role in recovery efforts after Hurricane Irma, which made landfall in Florida shortly after Harvey left its mark on Texas. Now, nearly a year later, operators and emer- gency personnel are ta k ing lessons learned from these re- sponses to prepare for the 2018 hurricane season, which offi- cially began on June 1. There's no doubt drones will once again be deployed to help speed up recovery efforts, but next time, operators will be even better prepared. "We're just in the first inning," said Christopher Todd, who is the founder/president of Airborne Response and director of the AUVSI Miami Satellite Chapter. "Drones are going to revolutionize storm and disaster response." ORGANIZING UAS EFFORTS One of the biggest challenges during Harvey, at least at first, was receiving emergency COAs COAs (Certificates of Waiver or Authorization), said Jamie Moore, who is head of the Public Safety UAS Response Team out of Johnson County, Texas, which is near Dallas. Even though his team members were covered by Part 107 and could deploy UAS in their jurisdiction, they didn't have authorization to f ly in ar- eas that needed their help after Harvey. The team was grounded for a day and a half before they could perform their first mis- sion—time that could have been spent helping with search and rescue and a variety of other missions. After the initial wait, the process became much smoother, with approvals coming quickly after requests were made to the FAA representative in Photo courtesy of Gene Robinson. 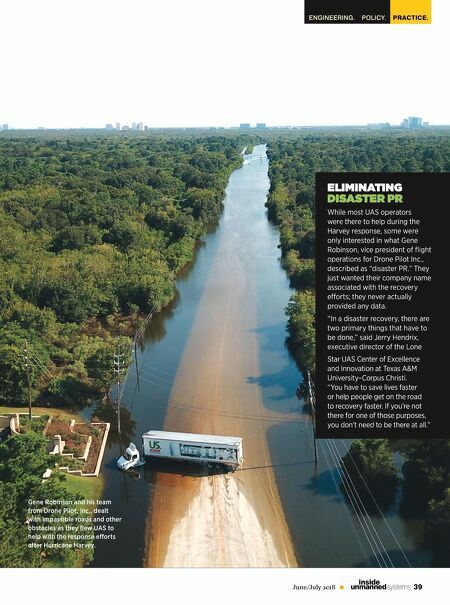 With this year's hurricane season upon us, drone operators are taking the lessons learned from Hurricanes Harvey and Irma to improve the industry's response to these types of disasters in the future. 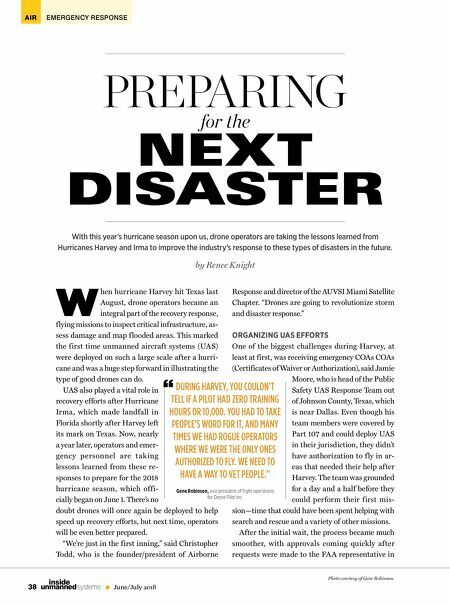 by Renee Knight NEXT DISASTER PREPARING for the DURING HARVEY, YOU COULDN'T TELL IF A PILOT HAD ZERO TRAINING HOURS OR 10,000. YOU HAD TO TAKE PEOPLE'S WORD FOR IT, AND MANY TIMES WE HAD ROGUE OPERATORS WHERE WE WERE THE ONLY ONES AUTHORIZED TO FLY. WE NEED TO HAVE A WAY TO VET PEOPLE." Gene Robinson, vice president of flight operations for Drone Pilot Inc. "